A solo exhibition last year by Aydin Aghdashloo pulled in a big crowd of his fans, young and old alike, who stood in long lines for hours to watch his great works. 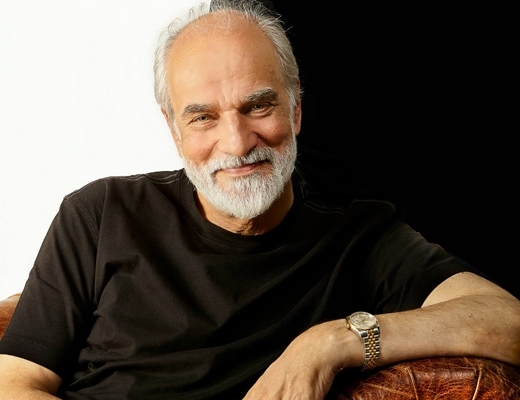 Aydin Aghdashloo, a contemporary Iranian visual artist, is no longer in Iran. He left the country in March to have a rest in another country and start to write an account of his past experiences and checkered career. The departure of Aydin Aghdashloo was perhaps one of the strangest events in Iran last year [ending March 20, 2015]. Aghdashloo, an artist who stayed in his home country for years despite ups and downs but decided to leave Iran at an old age, says he’s set out for a long journey this time around. By his own account, Aghdashloo wants to live outside Iran with his children for an indefinite period during which he can write his memoir. Aghdashloo, 75, has tested various branches of art, and served in different capacities from art critic to painter [to author, art historian and graphic designer]. He has made his name mostly in creating visual artistic works and in establishing his own progressive style in painting. Years of Fire and Snow and Memories of Destruction are the artist’s two collections [of paintings] which are starkly remarkable in the history of the contemporary visual art. In spite of his popularity in Iran, he has held only two solo exhibitions over the years: the first one came in 1975 and the second almost 40 years later in 2014. When Tehran’s Museum of Contemporary Art did not agree to organize the second event, Aghdashloo was forced to take care of the whole show single-handedly, something which he says he did out of bad luck. The fruit of his 40-year-long art career – some of which were borrowed from private art collectors – was eventually put on display at Tehran’s Assar Art Gallery. His fans, young and old alike, had come to see the show. A big crowd had gathered waiting in long lines to take a look at his artworks. The substantially large number of visitors turned into one of the sideline issues of the artistic event in 2014. Those who had come to visit the show would have never thought that they would one day stand in long lines outside an art gallery. He talked about his decision to stay in the country during the [Iran-Iraq] war, about different governments which treated him differently – although he had never expected to become prominent – and about the fact that his depression has internal, reasons such as overworking and old age, and not external. Aghdashloo seems to have done his fair share of the work by creating Memories of Destruction, a collection of 11 paintings during his stay in Iran. When he was not treated the way he truly deserved in his home country, he did not air any grievances, but decided to abandon canvas, painting and his country for an indefinite period. He set out on a journey in the last month of the Iranian year [March] to welcome Nowruz [New Year] in a country other than Iran. He talked about his decision to meet his children and write his memoir and about his paintbrush which will be replaced by his pen to depict words in another part of the world.